College Football 150th Anniversary is a non-profit corporation formed to plan and administer a national celebration of 150 seasons of collegiate football in 2019. The commemoration will showcase the rich history and traditions of the sport and its contribution to American society and culture, while also promoting the opportunity it continues to provide to thousands of student-athletes across all levels of the sport. The CFB150 staff reports to a Board of Directors made up of representatives from stakeholder groups throughout college football. The corporation has office space at the National Football Foundation & College Hall of Fame headquarters in Irving, Texas. Follow the campaign @CFB150 and take part in the conversation with the hashtag #CFB150. SIDEARM Sports, a Learfield company since June 2014, has experienced incredible organic growth from delivering quality service, reliability and customization. Serving more than 1,100 partners, SIDEARM Sports is the nation’s leading digital provider in college athletics, and its easy-to-use interface allows schools to customize their content streams and digital presence. The company plays host to nearly 305 Division I university athletic sites. SIDEARM Sports provides the software and technology that powers websites, mobile applications, live stats, social presence and video streaming for its athletic partners. Unequivocally, Bill Mallory was a giant. Whether it was DeKalb, Ill., Boulder, Colo., Oxford, Ohio, or Bloomington, Ind., — the communities where he admirably spearheaded NCAA Division I-A football programs — his achievements, reputation, passion, focus all transcended the norm. Better yet, as a person, Mallory was off the charts. He cared about everyone. Plus “The Old Man” — as he was affectionately known — still possessed more energy than people 20 years his junior. Integrity? In a 21st century where society and hierarchies are devoid of character, Mallory might have led the NCAA in that category. With Bill, three words come to mind: exceptional human being. Which is why his sudden death last week at age 82 due to two accidental falls is still profoundly shocking. Believe me, I’m thankful to have had the privilege of working with him, his staff, and student-athletes. Northern Illinois University is a better place, thanks to Bill—and not just intercollegiate athletics. Mallory was a winner and gave a fledging NIU program instant creditability. In hindsight, he was among a handful of I-A coaches to take four schools to major bowl games and reach Top 20 status with three programs (NIU’s 1983 Cal Bowl squad finished No. 30 in the final AP poll). Mallory still ranks on the all-time NCAA longevity (301 games) and victory (168) lists. In 27 seasons as a head coach, Mallory posted a 168-129-4 won-lost-tied record (.565 winning percentage) at Miami (OH) (39-12-0 in 1969-73), Colorado (35-21-1 in 1974-78), NIU (25-19-0 in 1980-83), and Indiana (69-77-3 in 1984-96). He is the only coach in Mid-American Conference history to win loop crowns and Coach of the Year honors at two schools (Miami in 1973 and NIU in 1983). Mallory’s Huskie resume includes the program’s first MAC grid title, the school’s first triumph over a Big Eight program (Kansas), and first I-A bowl success (Cal State Fullerton). His storied 1983 squad would be inducted into the NIU Athletics Hall of Fame and ultimately produced 19 professional players—including seven NFL draft picks. How and why did Mallory come to NIU? After a historic 11-0 season at Miami (OH) and a triumph over Florida in the Tangerine Bowl in 1973, Mallory was hired at Colorado by his sideline predecessor and new AD Eddie Crowder. After four winning seasons in five years, plus a Big Eight title and Orange Bowl berth in 1976, Mallory’s relationship soured with Crowder and major donor Robert Six, the (then) CEO of Continental Airlines. Despite pleas from the CU players, Mallory was fired. “We knew what happened at Colorado,” said Jerry Ippoliti, then assistant AD at NIU, former Huskie head coach, and Mallory teammate at Miami (OH). “(To Bill) it was an integrity issue. Bill wanted to run his own program. (Then NIU AD) Bob Brigham said to see if Bill was interested in our job which opened up at the end of 1979. 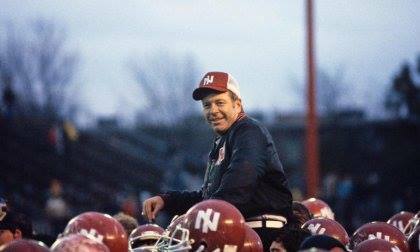 In one of the program’s best all-time hires, Mallory was named NIU head coach on January 4, 1980. “Northern Illinois has not achieved its potential,” Mallory told the media. “That’s why I’m here.” Always direct. Our media types loved it. While Mallory’s five-year plan had the Huskies winning the Mid-Am crown in 1984, his team peaked a year early. By Cal Bowl week in 1983, media reports had Mallory at Cincinnati and then Indiana. You don’t turn down a Big Ten opportunity. In 13 years with the Hoosiers, Mallory took IU to six bowl games. That figure and his 69 triumphs are still Indiana football career bests. Despite winning his final game vs. Purdue and being carried off the field by his IU players, Mallory was released again. To his credit, he said little in the media. He and his wife Ellie remained active in Bloomington. “Bill was a coach’s coach. Whenever you talked to people and you said you coached for Bill Mallory, everybody, everybody respected Bill Mallory,” Novak added. I’ve lost count in the number of halls of fame Mallory has been enshrined. NIU’s twice, Indiana’s, the Miami HOF and its “Cradle of Coaches” group (two separate entities), plus the MAC’s. But he belongs in one more—the College Football Hall of Fame in Atlanta. There’s only one problem, the College HOF’s criteria for coaches is a .600 career winning percentage. Considering where Bill won (for example, NIU had only three .500 or above seasons between 1969 and 1982), his character, integrity, and advocacy for higher education not only need to be considered, but recognized nationally. In this NCAA scandal-filled age, it’s hypocrisy to not. Yes, the College HOF and National Football Foundation has been great to NIU the last two decades with numerous honors. But it’s time to evaulate that outdated percentage criteria. There’s no more qualified candidate than Bill Mallory. He’s no flash-in-the-pan. A winner, father figure, coach’s coach, leader, “The Old Man” was a giant.